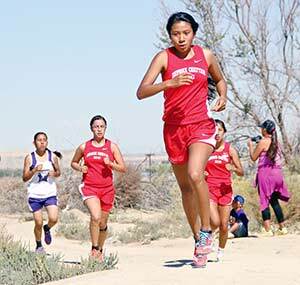 A Shiprock runner leads a small pack of Lady Chieftain runners during the Chieftain Cross-Country Invite on Sept. 20. As a team, Shiprock placed first to win their home meet. Winning races is always better when they are won as a team. At least that’s what top runners like Shiprock’s Lacey Howe and Zuni’s Selena Sanchez believe. On Sept. 20 Howe placed second in the Chieftain Cross Country Invite behind Montezuma Cortez runner Rachel Demby and Sanchez placed third. Howe and Sanchez had individual stellar finishes, but both were more satisfied to help their teams do well. “I just want to keep our record perfect like last year. I just want everyone to do good this year,” Howe said. Howe placed second overall with a time of 20:13, behind Demby, who finished first with a time of 19:54. Howe came in first for the team to help them with a first-place win with a total of 28 points. Sanchez finished third with a time of 20:25 and first for her team that finished in third with a total of 102 points behind Miyamura, who finished with 80 points. Sanchez said she was happy with her individual performance because it helped her team. “We made PRs and that’s a good thing for us, we’re still working at it to get to state and we want that championship again,” Sanchez said. “We want this to be a family game. We want to work as a team." Both Shiprock and Zuni showed up at the meet with their own agendas. Shiprock looked to win their home meet and see where they stood against Zuni. Shiprock head coach Alice Kinlichee said now that Zuni is in their district again they wanted to see how they would do against them.